As we all know, the stock front bumper on your trail rig is usually the first thing to see trail damage. Over the years, I have had many trail rigs and I've never been a big fan of cookie cuter pre made bumpers. They seem to be made too thin and don't hold up to abuse very well. On my new rig I wanted to make something rugged and functional, that was one of a kind. So I called up SillyFab Service in Chico, CA to assist me. 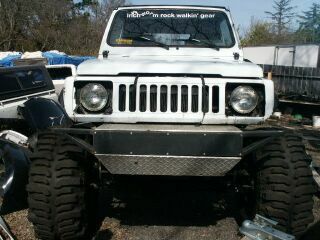 I wanted something smaller, heavier duty, with tow hooks, and with a winch mount for the future. 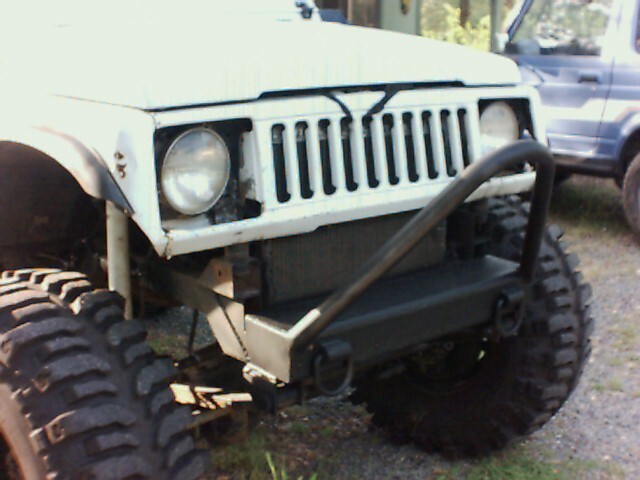 The 1st thing to do was to hack off the old bumper and part of the crossmember. 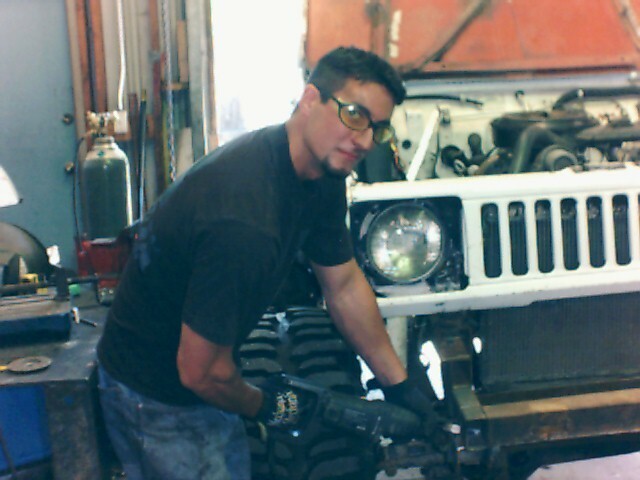 I told Phil (aka: SillyNeck) that I wanted a "stinger" and a bullet proof stubby bumper that was welded to the frame to become part of the rig itself. I don't like big cumbersome looking bumpers, so a custom job is the only way to go. Phil looked it over, and went to work. He boxed in the frame with some heavy square tube, welded it all up and ground the long front weld down to a nice smooth look. With that done, he got out some 1.75" tube and bent up a hoop for the "stinger". A little grinding on the tube ends to get the angle right and a sight adjustment from me to get the amount it stuck out the way I wanted, and he welded it up. All that was left, was to install 2 very beefy tow hooks. A little flat black and it's all done! I was very impressed with Phil's work! He is a very good fabricator, and his work looks like he has been doing it forever. I would like to highly recommend him for any fab work you want done. I'm going to hack off the back of the Suzuki and go flatbed so I think I'll have SillyFab help me out again! This bumper only goes for around $250 (depending on application) and was done in 3 to 4 hours give or take a little BS'ng. Way cheaper then the off the shelf stuff, and in my opinion much better!